The Voiles de Saint-Tropez assumes its place in maritime history taking centre stage at the Citadelle museum. Inaugurated in 2013, the museum highlights the port of Saint-Tropez’s prominence in French maritime history dating back to the 18th century. 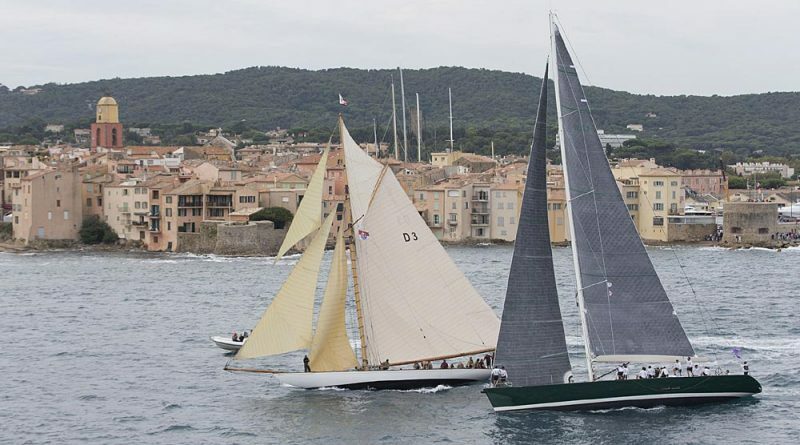 The 2017 addition to the museum of pleasure craft and racing will be significantly marked by the inclusion of two models: that of Ikra and Pride, the two original competitors of the Nioulargue, founding regatta of the Voiles de Saint-Tropez. 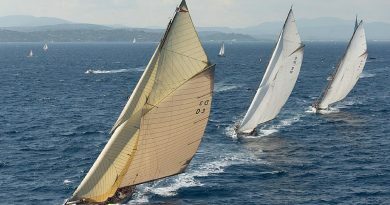 A precursor of the meeting of classic and modern yachts, this famous confrontation is today commemorated by as many as 300 of the most beautiful yachts in the world, meeting each year at the end of the summer season, in the gulf of Saint-Tropez. If the mythology of the America’s Cup is notable for the notion that “there is no second place,” the Nioulargue has passed into posterity for its surprising lack of a winner. When reflecting on this friendly challenge between yachtsman, under the initiative of Patrice de Colmont in 1981, between Ikra, a wooden 12 metre J1 built in 1964 and the Swan 44 Pride, 10 years its junior, one rarely seeks out the detail – that these two yachts raced from Portalet tower to the Nioulargue bouy (a Provencal name derived from the French ‘nid du large’ signifying the presence of fish nesting in the depths) in front of Pampelonne beach; the finish celebrated by the infamous banquet at Club 55. 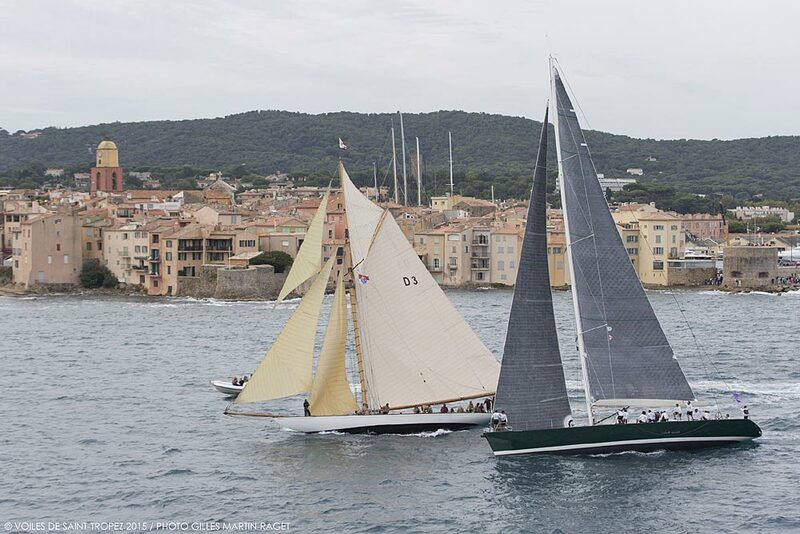 This was the founding moment of the celebrated competition which has filled the port of Saint-Tropez and its surrounding waters for more than 35 years. From his Parisian studio, Yves Gaignet recounts fond memories of the Nioulargue: “an enchanting, poetic and amusing period where there was a lot of fun to be had.” In 2015, the famous model maker responded with pleasure to president of the Société Nautique de Saint-Tropez, André Beaufils’ invitation to exhibit his work during the Voiles. 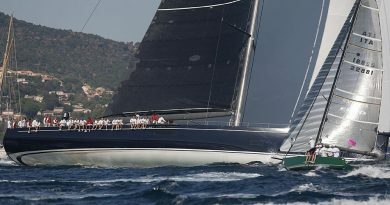 “I decided to present a model of Pride and Ikra side-by-side, reunited on the same finish line.” The contrast is striking, opposites not only in hull colour, the black Swan against the 12 meters’ white hull – but also in their conception, embodying a formidable evolution in the art of yacht racing. Represented on the scale of 1/28 and on the same waterline one can truly appreciate the differences between these two vessels. While the more modern boat measures 13.4m against her rival’s 21m, the surface sail area and weight is more than double: 81m² for Pride to 175m² for Ikra and 10 tonnes versus 27 tonnes! It is Patrice de Colman himself who has taken the initiative to acquire the superb models and to give them to the museum. “Several landmark discoveries in the last 20 years by Gilbert Buti, renowned university professor, form the core of the museum.” explains Laurent Pavlidis, town historian. “For example, the major role that the tropezienne fleet played during the 17th and 18th century in Turkey – Ottoman Empire – deprived of their own naval fleet by the Knights of Malta, the Turks called on French allies for assistance. Another example, the hydrographic institution of Saint-Tropez responsible for the training of over 1000 captains in coastal navigation in the 19th and 20th century. Or even coral fishing in the 16th and 17th century.” If the aim of the museum is not to cover all subjects extensively, the idea is rather to offer the visitor elements of reflexion. The second largest naval history museum in the Var, the Citadelle welcomes 100,000 visitors a year and provides an alternative view to the somewhat superficial image that is sometimes associated with home town of celebrated French admiral, Bailli de Suffren. Celebrating its 150th anniversary, the Yacht Club de France – to which the Société Nautique de Saint-Tropez is affiliated – embraces the mission to promote sailing in all its forms. Founded in 1867 by Napoleon III, passionately involved in the development of France’s maritime standing in the construction of pleasure craft and of sailing at its highest level. The Jubilee Book: A History of French Yachting, under the direction of Jacques Taglang: Frédéric Delaive, Louis Pillon, Dominique Gabirault, Antoine Sézérat, François Chevalier and Eric Vibart. Photographer: Laurent Charpentier. Square format, 30 x 30 cm, generously illustrated, 312 pages, canvas cover and jacket. A veritable institution where it is said that some train all year to be in the running, the boule contest is one of the highlights of the frenzied land activities during the Voiles. The rules require that teams consist of a mix of locals and crew from each boat. Scheduled for Wednesday, October 4th from 6pm at the Place des Lices, the competition has new incentive this year with the winner taking home a ski holiday for two in the Val d’Isère resort.